I saw my first Peter Jackson film at the cinema when I was nine. At nearly three hours, The Lord of the Rings: The Fellowship of the Ring was the longest film I saw in my pre-teen years. That was before I heard of extended editions and director’s cuts. Edited cuts of previously-released films are rare (nowadays they’re usually only released on Blu-ray), but with Jackson I came to expect them almost as often as Christmas presents. His films were released in December, then the following year the extended editions arrived on DVD. To my knowledge, he has released seven of them to date: extended version of the Lord of the Rings films; his remake of King Kong; and most recently, the Hobbit films. They all offer viewers the chance to go deeper into the worlds Jackson and his crew brought to life, and to see new scenes left on the cutting room floor. However, the question of whether they make the films better is hotly debated by fans and filmgoers. The Hobbit films are a special case - given the troubles they faced, they needed the extended treatment more than any other film Jackson has made. Based on the book by J. R. R. Tolkien, the Hobbit trilogy takes place sixty years before LotR. Bilbo Baggins, a reclusive Hobbit (played by Martin Freeman), is recruited by Gandalf the wizard (Ian McKellen) for a dangerous quest: to reclaim the Dwarf kingdom of Erebor (a.k.a. The Lonely Mountain) from the dragon Smaug. Bilbo joins a company of thirteen Dwarves led by Thorin Oakenshield, the last heir to Erebor’s throne (Richard Armitage), who doesn’t look kindly on Bilbo at first. However, with Gandalf’s support - and that of Thorin’s followers Balin, Dwalin, Fili, Kili, Oin, Gloin, Bifur, Bofur, Bombur, Dori, Nori, and Ori - Bilbo soldiers on. Together, they face hungry trolls, grotesque goblins, and vengeful orcs (among other creatures) on the road towards Erebor. Meanwhile, Gandalf investigates clues along the way that hint at the coming of a greater evil than Smaug. And, of course, Bilbo has some close encounters of his own - including a run-in with a certain gangrel creature with a certain gold ring. 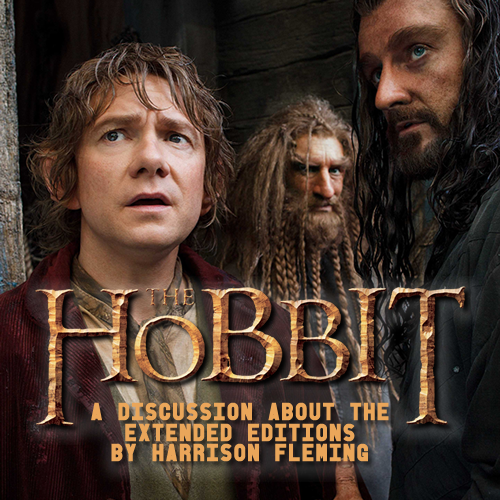 I chose to write about the Hobbit films because they had a much harder journey from page to screen than LotR. Jackson wanted to make the films since 1997, but couldn’t because the rights to adapt The Hobbit were split between Warner Bros. and MGM Pictures. While the studios struggled to make a deal to fund the films, Jackson and his crew began writing with Guillermo del Toro. They had planned to have del Toro direct the films, but MGM’s financial troubles delayed the project again and again until del Toro left. In 2010 a deal between Warner and MGM was finally reached, and Jackson stepped up to direct the films. However, the concept designs del Toro approved for the films were scrapped and Jackson had to start over. The studios gave him only five months to prepare for the films, which forced him to start filming without scripts, sets, and creature designs finalised. Jackson’s design crew had to develop things as they went along, and they were forced to rely on more CGI than they had on LotR. Worst of all, the producers at Warner and MGM ordered Jackson to write in a subplot that wasn’t in the book: a love triangle between Kili, the new Elf character Tauriel, and Legolas from LotR. The change was slammed by fans not only because Tauriel was written as a love interest, but because Legolas didn’t appear in the Hobbit novel at all (even though his father, Elvenking Thranduil, did appear). It had a terrible impact on Jackson’s plans for the last two films, forcing him to focus more on the subplot than the main story. Many battle scenes planned for the last film, The Battle of the Five Armies, were cut or even left unfinished, resulting in the film running shorter and getting worse reviews than its predecessors. Overall, the Hobbit films are shorter and less acclaimed than LotR - all because Jackson was denied the time and freedom he needed to do them justice. Because of the films’ flaws on their theatrical run, I came to see the extended editions as a second chance for The Hobbit. Peter Jackson was allowed to put an hour’s worth of footage back into the films; it’s small compared to the amount of footage returned to LotR (more than two hours), but it makes a huge difference. The extended cuts run more smoothly than the theatrical ones, and include scenes Jackson left unfinished the first time around. His crew were even allowed to fix continuity errors between the films - the biggest being Smaug’s design. In An Unexpected Journey, the dragon had four legs as he did in the book. However, his design wasn’t final; when Jackson filmed the sequel, The Desolation of Smaug, he had Smaug’s front legs removed so his actor - Benedict Cumberbatch - could use the dragon’s wings in his performance. For the extended edition of AUJ, the prologue was reshot using Smaug’s new design. The new shots only amount to a few seconds, but they help change the first film for the better; and they’re not the only changes that improve the films. With the extended editions, Jackson revealed more of Thorin’s backstory and gave the rest of the Dwarves more screen-time. In DoS, the opening scene is extended to bring Thorin’s father, Thrain, into the story; and Gandalf’s scenes are also extended to reveal Thrain’s fate. This is one of my favourite additions, and one I’m sure Tolkien’s fans will appreciate because it draws on appendices from LotR as well as The Hobbit. Tolkien planned to rewrite The Hobbit after he finished LotR to link the books more closely, but since he changed his mind before he passed away, the films’ extended editions are now the closest thing to the adult retelling he wanted to write. In fact, some of the new scenes are so violent they raised the films’ age rating from 12 to 15. However, the biggest and best changes come in the last instalment, The Battle of the Five Armies. At two hours and twenty minutes, BoFA’s theatrical cut is the shortest of the Hobbit films and the worst hit by their rushed filming schedule. I was very disappointed in the trilogy’s “defining chapter” because of its rapid pace and lack of emotional punch. The extended edition changed it for the better. Although he couldn’t remove the love triangle, Peter Jackson added twenty minutes back into the film. Most of the new footage takes place at the battle itself, and includes scenes that went unfinished at the time of the film’s first release. The arrival of Dain (Billy Connolly) now includes a cavalry of goat riders who attack the Elves before the Orcs appear. As well as padding the scene out, it answers the question of where Thorin and his friends found goats to ride to the film’s finale. The Dwarves get their own scenes in the battle too, giving it some much-needed comic relief. A particular highlight is a chariot chase featured in the trailers, which didn’t appear in the film’s theatrical cut. Finally, Thorin’s story gets the closure it deserves in a funeral scene, where he and the Arkenstone are laid to rest. My biggest issue with the film’s theatrical cut is that the stone - the ultimate goal of Thorin's quest - disappeared when the battle started and was never seen again. The extended edition changed that. Although it didn't surpass the ending of The Return of the King, it did bring the Hobbit films to the tragic conclusion they needed - true to the book and, more importantly, a fitting end to Peter Jackson's Middle-earth films. Since its release two years ago, the extended edition of BoFA has gained far better reviews than its theatrical cut. I have yet to meet anyone who prefers the theatrical cut. If, like me, you were disappointed by the Hobbit films in the cinema, I strongly urge you to follow Bilbo and Thorin one last time. The extended editions are a rare case among films where bigger is better. If you've seen them already, let us know what you think and tell us your favourite new or extended scene on Facebook and Twitter!